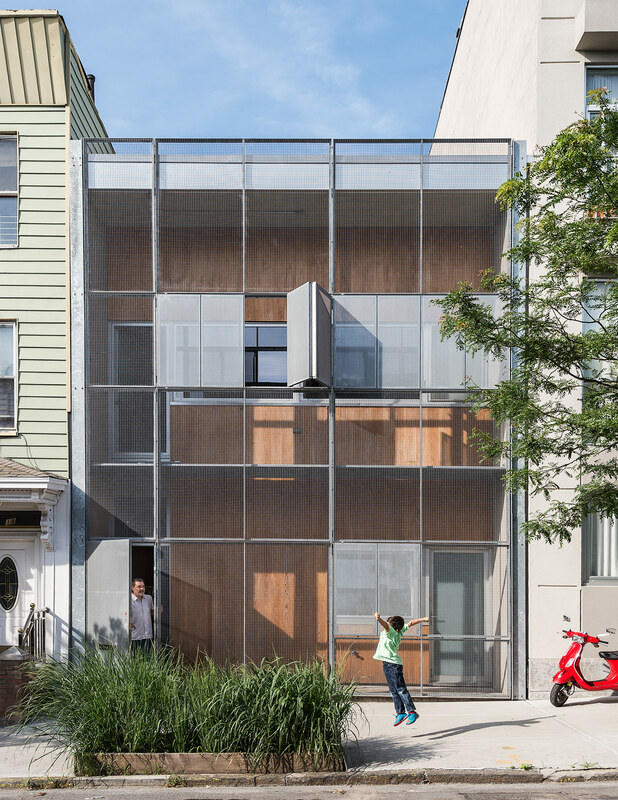 The Baumann family residence in Gowanus, Brooklyn, is all geometry up front, with a rectilinear grid of steel and cypress comprising the structure’s double facade. Up top, a verdant green roof of native grasses, wildflowers and fruits creates an oasis. 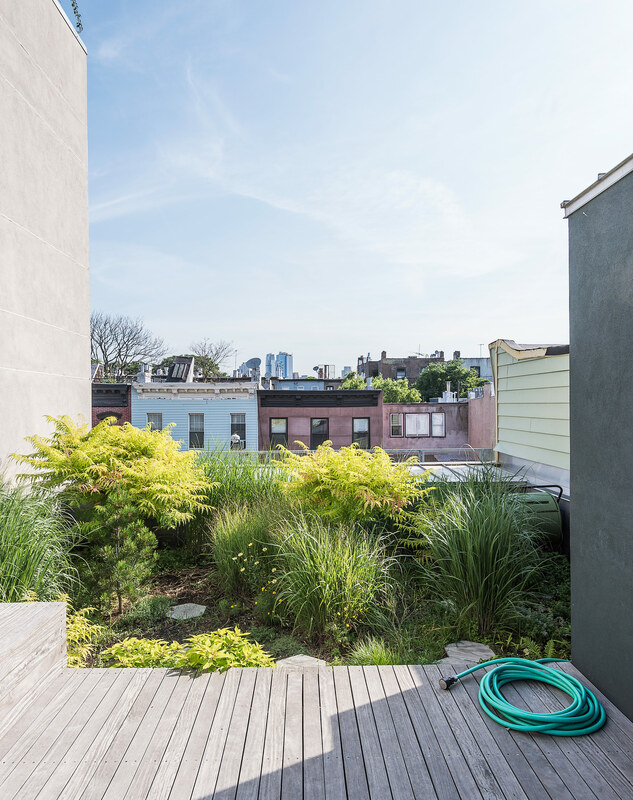 Vegetation from the garden on the lower roof provides a contrast to the backdrop of Gowanus’s rapidly changing landscape. Long, unobstructed corridors along the spine of the house provide ample cross-ventilation during warmer months—as well as sightlines that unite different areas of the home’s narrow, linear footprint. “When you’re in the back of the building, you can literally see the front door of the person across the street,” says architect and resident Philippe Baumann. Thick industrial glass lines the footing of the stairwell with subtle transparency, allowing light to also traverse the space vertically. The home’s enclosed courtyard sits at “the heart of the structure,” says Baumann, who resides with his wife, Lisa Sardinas, and eight-year-old son, Oskar. “This is clearly the dominant space; everything flexes towards it.” Baumann cast the square concrete floor tiles himself, enlisting the help of his son. A small, neat patch of grass—a playful nod to the archetypal domestic lawn—is edited down to a charming folly. Sheetrock surfaces comprise many of the interior walls, including one situated between the kitchen and dining area, which is furnished by benches and a table designed and built by Baumann, alongside HAL chairs by Jasper Morrison for Vitra. The sculpture on the wall is by artist Peter Dudek, a friend of the family, and the pendants are by Glashütte Limburg. Baumann made a point to integrate industrial materials throughout, exposing steel beams and setting the floor in concrete. “We have all these different destinations,” says Sardinas, a writer who works from her home office. “I’ll be working, get stuck on a passage, and take a break to go read outside.” On the lower roof, red Vegetal chairs by Erwan and Ronan Bouroullec for Vitra provide moments for repose. 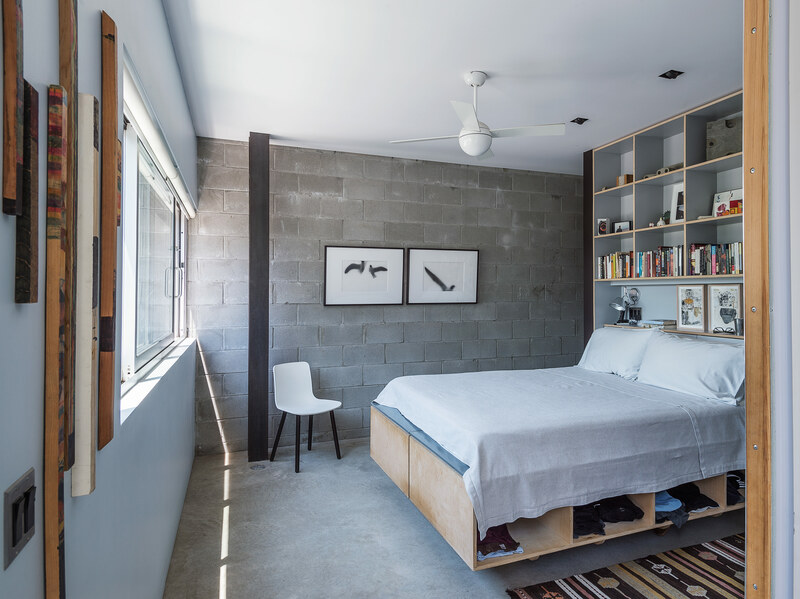 Baumann designed the plywood bed frame and shelving unit in the master bedroom, adjacent to an exposed cinder-block wall, a new addition to the structure. The upstairs showers are particularly ingenious: Operable skylights loom above, and perforated, galvanized-steel platforms open up to spacious, sunken bathtubs. On a lone residential block in a neighborhood triangulated by the Gowanus Canal, a concrete plant, and an elevated subway line, a starkly modernist home sits between two nondescript residential buildings. From the exterior, one would hardly guess that the double-facade structure—a sleek, cypress-clad box overlaid with a grid of perforated galvanized-steel shutters—conceals fragments of salvaged cinder-block walls. But it’s here, on the site of a former parking garage in the heart of South Brooklyn, that architect Philippe Baumann created a home for his family. Despite its proximity to the waterway, which was designated a Superfund site by the Environmental Protection Agency in 2010, the neighborhood of Gowanus has seen incredible renewal in recent years as demand for housing stock in Brooklyn continues to increase. It was that very liminal, gritty character, in fact, that first posed a draw for Baumann, who has lived in artistic pockets of industrial areas for the better part of his adult life. “One of the things that provoked my love for Gowanus is that it had the feel that Williamsburg once did,” he says, referring to the North Brooklyn neighborhood where he rented a railroad apartment for 15 years, well before the area swelled in popularity (and accordingly, new high-rise construction). As Baumann—who runs his own firm in Manhattan and teaches architecture at Pratt Institute—and his wife, Lisa Sardinas, a writer, got married and had a son, Oskar, now age eight, the family of three had begun to more seriously consider a long-term dwelling. Following extensive research into the borough’s idiosyncratic zoning laws, they decided a garage structure in Gowanus would serve as the ideal site to build upon, and so purchased the lot in 2009. The choice was largely strategic: If he could keep the bones of the original structure intact, Baumann would retain the city’s recognition of the site as a garage—and, effectively, the grandfathered clauses enabling him to capitalize on the entire length of the narrow footprint. “That’s the only way we would have been able to use the full lot, and the only way we could have ever built the interior courtyard,” he reasons, referring to the central space that defines the core of the home. Connecting the living room and the den with wall-to-ceiling sliding doors on opposite ends, the enclosure opens up to crisp white walls that frame an expansive view of the sky. Beneath, a tight grid of concrete tiles encapsulates a small, manicured patch of grass. “This is our homage to the American dream, our little lawn,” Baumann says. “This is what I consider the urban courtyard; it’s intentionally very spare.” Landscaping grows more freely atop the building’s green roof, where a mix of indigenous wild grasses, flowers, fruits, and vegetables sprawl organically. “This building is about the courtyard, first and foremost, and after that it’s about the ability to have a productive garden space in the city,” he adds. Out front, the building’s double facade carves out a series of additional outdoor spaces. Extending five feet beyond the secondary facade, the steel mesh exterior both acts as a protective barrier and creates a transparent layer in-between—what Baumann refers to as the “buffer zone.” Each level of the interstitial space is used in various ways. On the ground floor, the family stores objects otherwise found or used on a porch: bicycles, plants, a chair or two for lounging. On the second floor, a steel rope stretches across the width of the building, used as a laundry line for drying clothes. On warm days, the family will keep the operable shutters wide open, providing highly efficient cooling ventilation. Radiant heat keeps the home warm during winter months, extending out onto the sidewalk to prevent snow from accumulating curbside (much to the envy of the family’s neighbors). Inside, sightlines run throughout the building’s length, from the kitchen to the outdoor courtyard beyond. Planes of bold, complementary colors—backsplashes of cobalt blue in the kitchen, pumpkin orange in the dining area, and avocado green in Sardinas’s home office—reverberate and soften the industrial palette of concrete, cinder blocks, and steel. A collection of artworks—a mix of purchases, barters, and loans from the couple’s various artist friends—imbues the space with warmth and character. Custom furnishings and clever solutions abound. In the upstairs bathrooms, extra-high showerheads—Baumann looms tall, at six foot four inches—are installed beneath operable skylights, and showering platforms made of perforated, stainless-steel grating flip up to reveal a sunken bathtub. Maximizing area both laterally and vertically, they’re easily the most inventive spaces in the home, and make bath time an adventure for Oskar: “He takes more baths than any kid I know,” says Baumann.